This beautiful desk set includes a desk pad, a letter-size document tray, a pen/pencil cup, a sticky note/phone holder and hinged supply box. 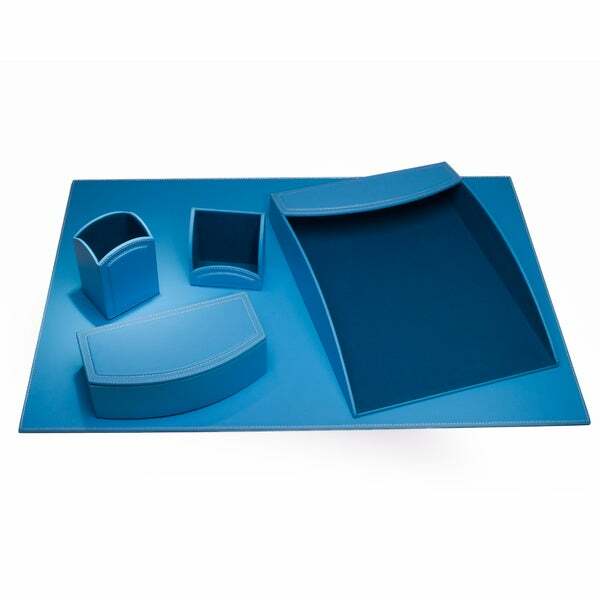 Designed to provide some color to your desk, this set is a stylish and practical addition to your office. Its plastic-y. If that's what you're going for....like maybe for a kids room....then you should see 5-stars here. For me....meh. it looks a little cheap. "Is this more blue as in the first picture showing the entire set or more of a teal color, as shown in the other pictures of individal items?"